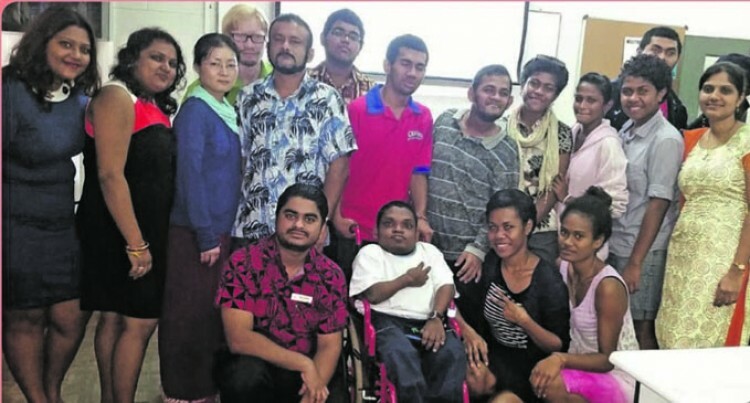 Trainers from Fiji National University’s National Training and Productivity Centre with special students during a recenet training session. According to the 2017 Census report in Fiji, a total of 113,595 persons aged three and above live with at least one disability. That constitutes to almost 13.7 per cent of the country’s population. The fundamental question is what does the future hold for our citizens who are living with one or more impairment. What are their opportunities; what their limitations are, and how can people with special needs be assured of greater accessibility to education and workforce. While there are a few special schools in the country, families opt to keep their children home due to lack of technical and financial support available for persons with impairments. While the universal declaration on human rights, convention on the rights of persons with disabilities, and the constitution of the Republic of Fiji has set standards and guidelines for adaptation of disability policies for every organisation in the county. It is important for all major stakeholders to also ensure that the rights of our citizens are advocated and the initiatives supported with robust strategic plans so that the services are successfully deployed across the various communities and not just in segregated or marginalised settings. A typical example of the need for awareness is that currently most carparks in Suva have special provisions for disabled parking, however they are barely used by the rightful citizens. The fundamental idea of empowering citizens with special needs is to allow them to have independence and equal opportunities, which would make them nothing less than a fully abled person. Skills trainings at National Training and Productivity Centre (NTPC) started an initiative in 2014. Persons with audio, visual, physical, learning and mental impairments were trained in the areas of fashion design, information technology and construction. Till date, NTPC has trained over 75 special students. The recent graduates include five students with mild to acute cerebral palsy. This is a remarkable achievement as initially, mobility and motor skills of these students were greatly challenged. However, an inclusive environment, comprising of support from trainers and classmates, medical checkups and an overall positive attitude has proven helpful towards the success of these students. These students were mostly enrolled in information communication technology and construction courses, including short courses and two-year diploma programmes. The inclusion of these students in the classes was initially a challenge due to lack of early intervention and support. Most of the students needed additional support in language and numeracy to enable them to qualify for tertiary studies. Trainers undertook basic training on sign language and awareness on recognising signs of impairments, both diagnosed and undiagnosed. International affiliations with organisations that work with students with special needs played a crucial role in helping trainers establish the issues these students faced at a preliminary level. This was initially not as simple as there were students who had different types of impairments, syndromes and conditions in the same classroom. For example, the first class had 15 students who lived with 1 or more impairments. However, the learning needs of these students greatly differed. Some needed visual assistance, while some needed auditory assistance. Some students had mental and learning disorders while some had limited motor and mobility skills such as those who live with cerebral palsy. There was a dire need for customised approach to training which stems from individual adjustment forms. Another challenge was that most of these conditions were not well diagnosed as we currently lack expertise in assisting physical, intellectual, learning and mental challenges in the classroom. Moreover, many parents and guardians were not declaring the conditions the student lived with, which made it challenging for lecturers and facilitators to proactively prepare for reasonable adjustment. Intervention processes started when trainers of NTPC and Academic services carried out a series of consultative meetings to discuss how best we can help our students have an inclusive education. The process started with a thorough analysis of the students we train, who are living with one or more impairments, syndrome, conditions, or a combination of issues that limits their access to an education as any other student of FNU. A penal of academics, medical experts and student support executives created short term and long term strategies to support an environment which is not only inclusive but also conducive to learning. These include creation of individual adjustment forms to provide for all provisions for inclusive as well as affiliations with international university for research and development of assistive technology. Constant discussions led to projects plans which included implementation of basic accessibly and assistive software for the visually impaired. Screen readers for both diagrams, text and mathematical symbols are currently being used by trainers, while the Disability Office assists by converting the text to speech and speech to text. Some materials also needed additional alternative text to be able to read diagrams. The Teiresias Centre of Masaryk University in Czech Republic is an educational center that has its own student administration unit to support the study of students with disabilities, offers counselling and methodological support to high school students and teachers. Using Masaryk University as a benchmark, FNU is now in the process of further developing its office for disability Services to become the hub for disability services in the Pacific. This will provide extensive support to students, staff, and persons in the region who live with impairments. The centre will be fully equipped with assistive technology, training, operational arrangements for easier mobility and access into all campuses of FNU, training and support for staff on special and inclusive education. In addition to that, FNU has a memorandum of understanding with Pacific disability forum. FNU has been working in consultation and networking with universities in Australia through the Australian Disability Clearinghouse on Education and Training (ADCET) to contextualise international examples to be adapted for use in the pacific region. Facilities at campuses to be accessible and friendly to persons with physical disabilities, including accessible washrooms, ramps, disability parking etc. A free website which will give virtual support and awareness with online videos on the implementation and use of both open source and proprietary technology. With the above interventions, it is hoped that our communities, families, NGOs and schools collaborate and start early interventions to ensure that people with special needs are well included in every aspect of education and work life. The world has benefited from the immense contributions of some brilliant minds such as Professor Stephen Hawking’s without whose input, we would understand far less about our universe and its wonders. However, it is imperative that Professor Hawking’s success was supported with the best medical services, assistive technology and strong national policies on inclusiveness. That enabled other citizens in his country who live with disabilities to have equal access to education, employment and other aspects of the greater society. Professor Hawking’s work is truly inspirational, and an evidence to identify and nurture the potential and talent of every persons. The collaborative efforts between NTPC, academic office, and students with special needs has ensured that our students get utmost care and support in their educational journey. NTPC is proud to announce that one of our students who lives with moderate cerebral palsy Peniana Lutunavuai has been nominated for best student awards. One of the most remarkable observations was that Peniana initially had minimum motor skills which inhibited her ability to write. However, with training, support and the encouraging inclusive environment, Mr Lutunavuai is now not only ambidextrous, but also a contender for best student award. As an educator, I strongly believe that education is for everyone, and persons living with any form of disability will need timely medical, financial and social support to live their lives to full potential.